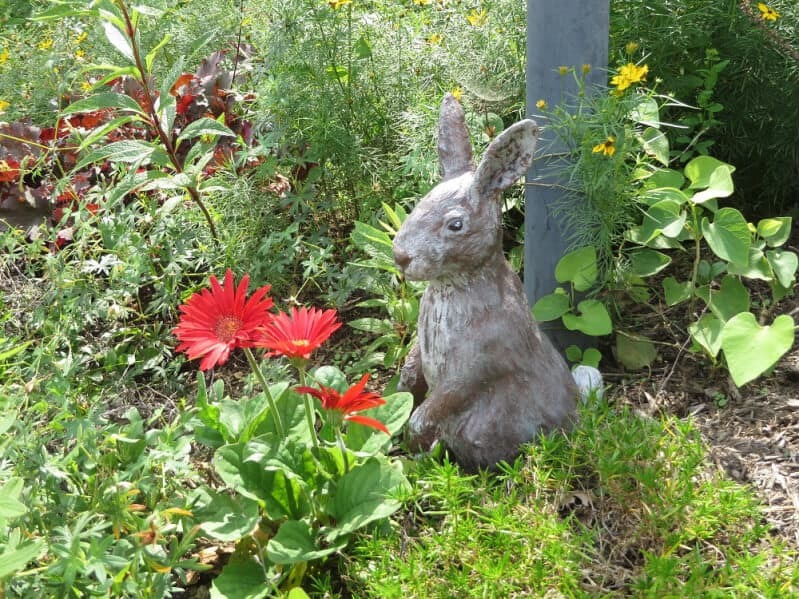 Eileen is back to show us how her outdoor bunny sculpture turned out. Thanks, Eileen! I wanted to take a moment to show you the finished product of the Pal Tiya rabbit. I painted it and it is already in the garden. Poor little guy had to endure major thunderstorms on his first night out! He fared quite well. Painting the sculpture is a bit different than in painting a paper mache sculpture. Kim Beaton says to dampen the sculpture with water first so the medium will accept the paint. Then, one also needs to add a small amount of water to the paint as well and do many layers. I used Behr indoor/outdoor paint. I found it at Lowes and got the sample sizes. They actually had to mix them, they do not come premixed. Four colors were used, a medium brown, white, black and a blue close to ultramarine blue. From those colors I mixed various shades of brown and gray. To start off, the whole piece was painted with the medium brown, started mixing the other colors and pretty much dry brushed over the fur with various shades until I got the look I wanted. I used black enamel for the eyes. With paper mache, I usually use acrylic glazing liquid mixed with raw umber to do washes at the end so the darks will be in the crevasses. I did not use it because I did not know if it would hold up outdoors. Close-Up photo of the rabbit’s head. To finish, I sealed it with a waterproof outdoor satin polyurethane. I really did not like the gloss finish so I took a chance and used a final layer of artist quality matte varnish to get rid of the glossy finish. Except for the eyes- I left them shiny. We shall see if it holds up to weather. What I did notice is that Pal Tiya really soaks in the paint so much more than a paper mache sculpture does. It took a lot of layers very well and dry brushing really did add a lot of dimension. That’s all Folks. If you do a Pal Tiya piece, please share it with us on the site, we would all love to see it! Adorable bunny! Who doesn’t love a rabbit? How far does the medium go? I’m anxious to see your next project! HA! If I am the expert, we are all in trouble! Glad you like the bunny and I appreciate your comment. 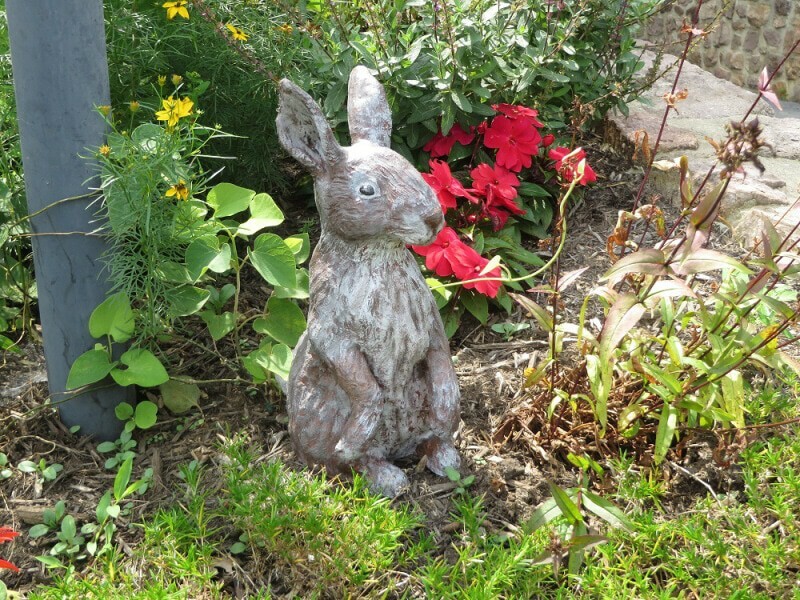 Eileen, we all absolutely LOVE the Rabbit….Gosh it is just fantastic! Thanks! That is high praise coming from the source! Tell me, was the US trial successful? Will we be able to continuously get Pal Tiya? I’m not sure how this works. Eileen, I love your bunny, it is so cute and the colors came out really well. I have not started my project yet but I now have some more information on how to paint it when I do. Get busy girl! I cant wait to see what you come up with! Did you get the 8 lb pkg? Or will you be doing something large? Make sure you post a pic when you are done! Pal Tiya unpainted is pretty cool by itself-it is just a matter of preference at the time of sculpting. Hi Eileen, I got 2 8 lb. bags and I have a project I have never done before but I am wanting to try out. Unfortunately, this winter and spring our roof leaked like a sieve and had umpteen containers around the house and I now have to clear the space. when I do, I will definitely get on the eight ball and get started. We are going to fix the roof and hopefully next rainy season we do not have Noah’s flood. Oooh so sorry to hear of your troubles! Don’t you live in the Seattle area? When don’t you have rain? Did the rain inside ruin walls, floors, etc? We had a second floor addition put on years ago and the roof only had the tar paper on it when we had a torrential downpour/storm. Like you, we had containers everywhere. There was no damage to the new upstairs but years later the plaster ceilings started leaching and making all the paint chip off. We had to remove all the paint and start over. What a mess….so I feel your pain. 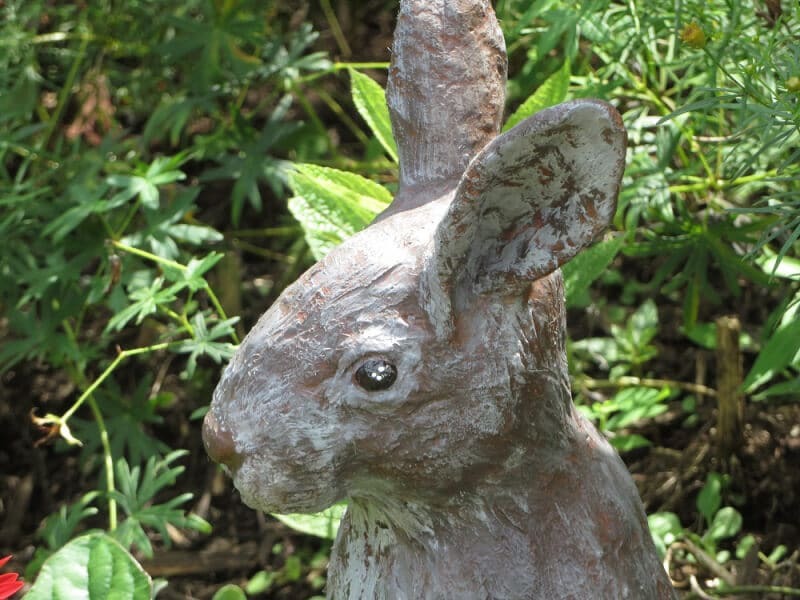 I really like the Pal Tiya rabbit garden sculpture. i hope to see more articles about the Pal Tiya and its use. Thanks Joni-Have you perused their website? Kim Beaton has a bunch of tutorials and she is a super teacher. I promise your time will not be wasted. Hello Eileen, your rabbit is so cute!!! May I know what kind of matte varnish did you use? I cannot find one that is really matte! It was Liquitex. I know what you mean about not truly being “matte” but this one does fine. When doing paper mache, I will sometimes, especially with birds, use 3 types of varnish. Matte for the body, satin for the legs, gloss for the eyes. I wonder if people notice? Thanks Jonni, thanks for writing up the tutorial, you make it look so professional! I have gone through the Pal Tiya website and there was never a mention of primer anywhere and it did not dawn on me either. I don’t see why that would not work. I did not use all that much paint, just noticed that it soaked in so much more than with paper mache. I will definitely use it again, I have already promised one for my daughter. One day it would be fun to do something really big and dramatic. Don’t know what though and it would have to be when my regular sculpting is caught up for the shows! Yes, big and spectacular. I love your bunny. Interesting about the paint you used. I’ll have to pay attention is those little cans of paint go on sale! Jonni, Minnesota is looking like a wonderful place to move! I lost Teca because she lured me outside and then chased a cat. It is over 90, so I ended up sitting by the front fence watching for when she would come back and keep her from getting hit by a car. Good thing she “stays”! Thanks, again, Eileen. Beautiful bunny. I get so little done I’m not sure I can switch to another medium, but it looks terrific. Rex, we need the end of that story. Did Teca come back? Yes, she came back, but she was gone a long time — made longer by the heat! She came dashing across the road as two cars were coming down the street, so I yelled at her and she hurried. Nice little house for a nice price! Oh my – Teca must have given you a fright. Of course dogs don’t know that cars don’t have enough sense to go around a dog, so they never seem to learn. I’m glad she’s home safe and sound. It is a cute house. I don’t think I’ve ever been to that town, so I can’t vouch for it. Some towns here are really nice, like mine, but others are run-down and look sad, even though they’re only a few miles apart. I don’t know what causes the difference. A sociology student should do a study. Hi Eileen. 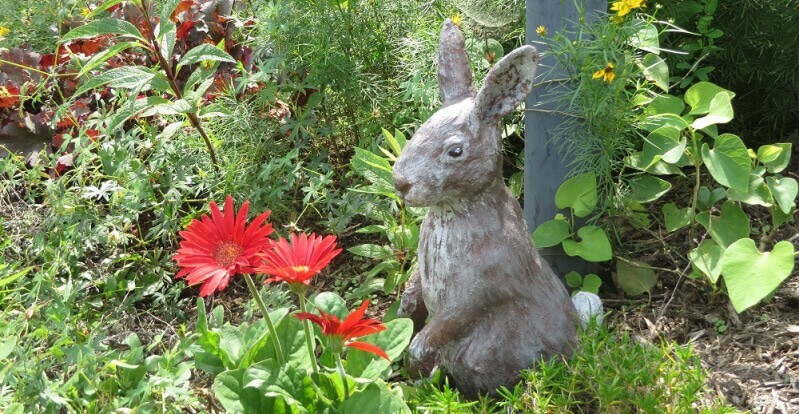 Your bunny is so cute – thanks so much for letting us see how he turned out. Do you know if Kim has ever suggested using a primer before painting so you wouldn’t need to use so much paint? I wonder if that would make it look less natural when it was done? And now that you’ve had the experience, do you think you’ll be making more outdoor sculptures with Pal Tiya?